Joplin is a city in southwest Missouri that started life as a mining boomtown at the end of the 19th century. It is located on Route 66 and is a starting point for tourists driving along this historic road. A great place to learn about the city’s rough past as a mining town is the Joplin Museum Complex, with a range of exhibits that include some unique rocks, a tooth of a wooly mammoth, and an exhibit on the robbers Bonnie and Clyde, who spent some time in the city in 1933. Nature lovers will enjoy Grand Falls, which spills down 12 feet into a pool popular for swimming and fishing. The Wildcat Glades Conservation and Audubon Center protects the vulnerable chert glades as well as the unique biodiversity of the area, while the George Washington Carver National Monument celebrates works of the world-famous scientist and naturalist George Washington Carver. The George Washington Carver National Monument is a park established in 1943 in Newton County, Missouri. The park is located near the 210-acre farm where George Washington Carver, a world-renowned scientist, educator, botanist, chemist, agronomist, and inventor, was raised. It was the first national monument established in honor of an African American and the first one dedicated to a non-president. Sculptures in the park include a statue of Carver as a young boy and the George Washington Carver Talking Bust. Visitors can see his birth site as they walk along the ¾-mile-long Carver Trail, which also showcases the boy Carver statue and numerous plaques with inspiring quotes by George Washington Carver. Part of the park is also the historic Carver House, the cemetery where the members of the Carver family members were buried, and 140 acres of carefully restored tallgrass prairie. Candy House Gourmet is large candy factory in downtown Joplin that has been a local delight since 1970. The owners have changed over the years, but the current owner has inherited the old recipes and continues to make everyone’s favorite sweets. They make everything by hand: Chocolates, truffles, English toffee, caramel pecan treats, and gourmet popcorn in all sorts of flavors including brittle, fudge, divinity, pecan logs, sea salt caramels and much more. In the spring, they dip fresh ripe strawberries in chocolate, and in the fall they do the same thing with apples. The factory includes a large showroom where you can browse and load your basket while enjoying free samples. There is a window to the next door factory where they make all the goodies. You can join a tour of the factory and see how it is all made. 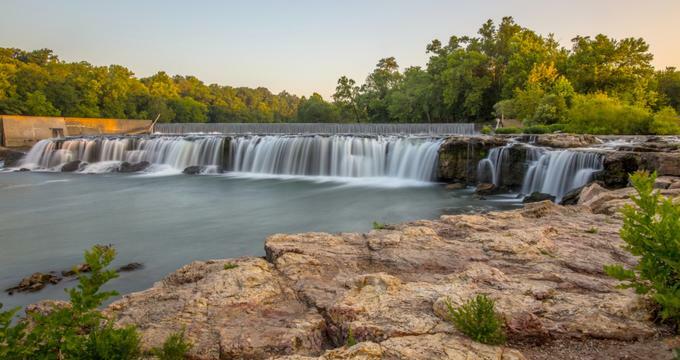 Grand Falls is Missouri’s largest continuously flowing waterfall. It is formed by the water of Shoal Creek dropping down 12 feet into a large pool, which is popular for swimming and fishing. The falls spill over a ledge of chert rock 163 feet across. What makes the fall so unique is that there is water in the creek year round, so the waterfall is always running. Above the falls is a man-made dam, built to form a reservoir that provides water to Joplin. Next to the falls are more outcroppings of chert that are filled with water, creating pools that kids love to splash in. Joplin is nice place to visit, but even if you are just passing through, you have to check out Joplin 44 Petro. It is far more than just a gas station and a place to service your truck. The place is massive, and kids just love the huge truck that rotates in the middle of the store. There are several restaurants, a convenience store, movie theatre, showers, laundry service, snack shop, and all sorts of travel gear for sale. They also host large events such as the 9th Annual Guilty By Association Truck Show, which had more than 400 semis on display. Joplin Museum Complex is a great place to learn about the city’s past as a mining boomtown. The complex, located in Schifferdecker Park, combines two mining museums with a range of exciting exhibits. 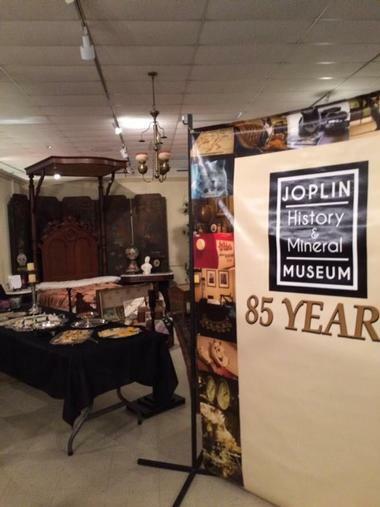 The Everett J. Ritchie Tri-State Mineral Museum takes you inside a replica of an old mine shaft, where you can learn about the origins of Joplin as a mining town and see some interesting rocks, some of them glowing. The Dorothea B. Hoover Historical Museum includes exhibits on historic Route 66, Bonnie and Clyde's adventures while in Joplin, the Joplin Sports Hall of Fame, the National Cookie Cutter Museum, the mysterious Spooklight, woolly mammoth fossils, Native American arrowheads, and a giant 6-foot dinosaur made of scrap metal. Red Onion Café is a cozy, pleasant restaurant in historic downtown Joplin. Located in a nicely renovated 100-year-old building, the unpretentious decor with industrial touches, exposed pipes on the ceiling, and comfortable banquettes creates a perfect atmosphere for family dinners as well as business lunches. The menu is traditional mid-Western with specialties such as David's Fried Chicken Salad and a smoked chicken dip. Red Onion Café prides itself on fresh salads that are chopped every morning, house-made salad dressings, steaks that are cut daily in their own kitchen, and every entree cooked to order. Red Onion also offers first-class catering for events of any size. Route 66 Mural Park is a public park opened in 2013 in Joplin, Missouri. It serves as a touchstone for tourists exploring US Route 66 and as a focal point for preserving the historic route in Missouri. Inside the park are two large tile murals designed by artists Jon White and Chris Auckerman and produced by Images In Tile USA, named Cruisin’ into Joplin and The American Ribbon. One of the park’s most popular features is a red mock 1964 Corvette that visitors like to sit in for a photo opportunity. Near the intersection of Main and 7th Street is another mural that covers the south side of the iconic green hardware store Pearl Brothers. Sandstone Gardens is much more than a home and garden store. Located in a beautiful 68-acre turn-of-the-century estate, this unique place has been converted into a 50,000-square-foot major Midwest home and garden showroom. Here you can find just about anything for decorating your home or outdoor landscape, with everything beautifully displayed in the garden’s rooms. There is a range of cast stone decorative items, eclectic furniture for any style, indoor and outdoor accent lighting, wall art and decor, botanicals, textiles, dinnerware, aromatherapy, and much more. Shoppers can enjoy gourmet lunch at the Sandstone’s Bistro, known for its superb entrees and desserts. Located in the beautiful old Gryphon Building on Joplin’s Main Street, Sweet Caroline’s is the place where the locals go for their coffee and ice creams. High ceilings, large pillars, and cute retro blue seating create a unique, cool atmosphere where you can spend hours sampling their ice creams. There are 32 flavors and they often change them. If you ask, they will give you free samples to help you choose, not an easy task. These ice creams are artisan, hand-dipped, and perfect, while their coffee is robust and full-flavored and you can smell it as soon you enter the shop. They also sell gourmet chocolates – try their salted-caramel turtles – as well as all kinds of old-fashioned candies for every occasion. The Wildcat Glades Conservation and Audubon Center is a conservation and environmental education facility located in Joplin, Missouri, at the confluence of Shoal and Silver Creeks. It has been established to protect the last remnants of the unique chert glades ecosystem, together with other resources of the highly biodiverse Spring River watershed. What makes this environment so unique is that the plants and animals that live in the chert glades, a specific kind of bedrock, while existing individually elsewhere, do not live together anywhere else as they do in Wildcat Glades. There is a huge variety of animals and plants to be discovered in the surrounding prairie-savanna, caves, riparian corridor, and hickory/oak woodlands that together form an unusual spot of biological diversity that is being studied, monitored, documented, and protected through outreach education to the local and regional community.